Does 30 damage for every heads you flip, and 30 more damage for every energy attached to both Pokemon on the field. 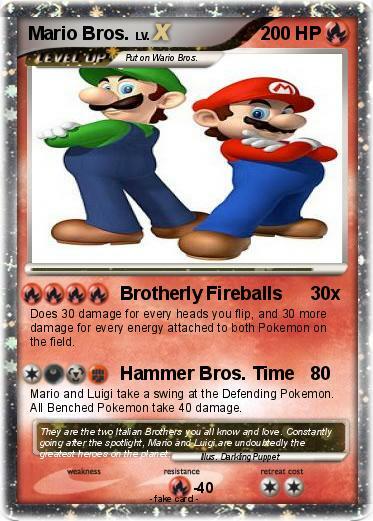 Mario and Luigi take a swing at the Defending Pokemon. All Benched Pokemon take 40 damage. Comments : They are the two Italian Brothers you all know and love. Constantly going after the spotlight, Mario and Luigi are undoubtedly the greatest heroes on the planet.